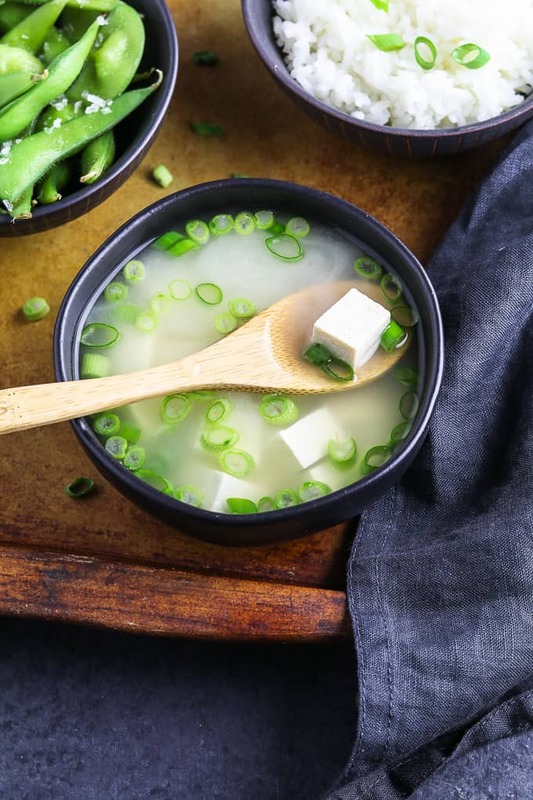 This Vegan Miso Soup can be enjoyed all year long as a starter or a complete meal. It’s light, healthy and packed with umami flavors. It requires 5 ingredients and will be on your table in 15 minutes! 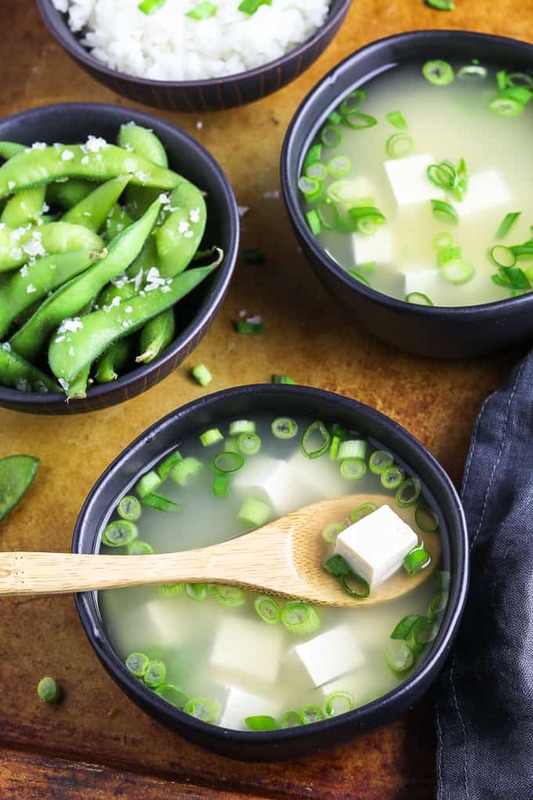 If you’re looking for fast, simple and delicious, then you need to make this Vegan Miso Soup tonight! You might even have all the ingredients in your kitchen now. You’ll need Water, Nori, Tofu, Green Onions, and Miso Paste. That’s it! It’s a traditional Japanese soup with a briny broth made from fish flakes and kombu (seaweed) as a base. Then miso paste is dissolved into the broth for a rich umami flavor. Typically, it contains cubed tofu and green onions too. There are three common varieties to choose from – Red Miso, Yellow Miso, and White Miso. The red miso is fermented the longest and has a deep flavor, but personally, I think it’s a little overpowering and salty tasting. Yellow miso is fermented for about a year and has a milder flavor. It’s slightly sweeter than the red miso and less salty. The white miso is the lightest and sweetest of them all, and it’s fermented for just a few weeks. I usually stick with the white or yellow for miso soup, but I used white for the soup in the photos. Miso is great to have on hand and it can be used for a variety of recipes like Dressing, Marinades, Sauces, Broths, Casseroles and more. 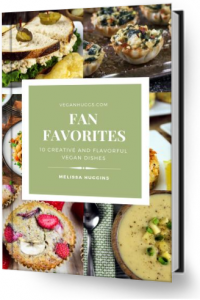 You can bring out the ‘cheesy” flavor in Vegan Mac n Cheese, or amp up a Veggie Stir Fry Recipe in a flash. A little bit goes a long way. 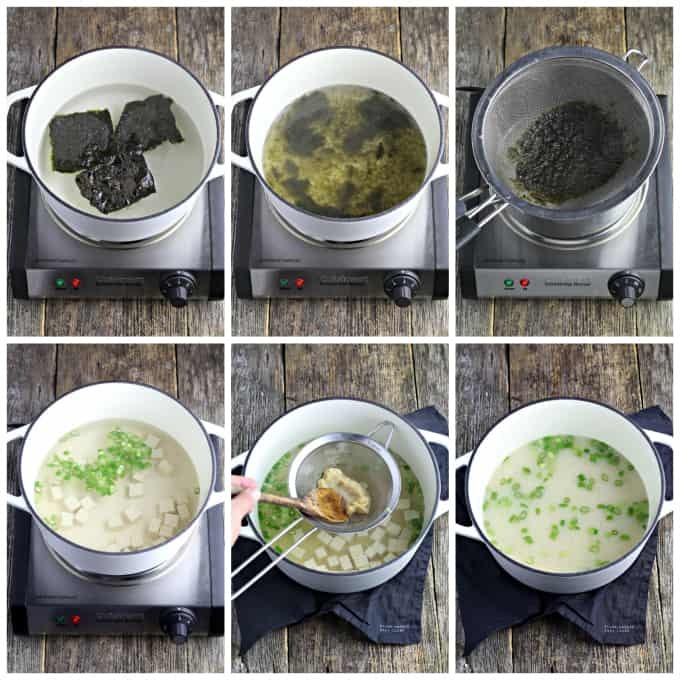 WHAT KIND OF SEAWEED IS BEST FOR MISO SOUP? The most commonly used seaweed is Kombu and Wakame, but I use Nori because I usually have it on hand. You can use any type of seaweed that you prefer. If you don’t like the taste of seaweed, you can omit it altogether. For extra broth flavor, you can substitute 1/2 the water with low-sodium vegetable broth or add a dash of tamari. Bring water to a boil over high heat then reduce heat to a gentle simmer. Break up nori into a few pieces and add to water. Simmer for a few minutes until it breaks down. Remove from heat and pour broth through a Mesh Strainer into another pot or large heat-safe bowl. Return strained broth to the pot and return to the stovetop over medium heat. Add tofu and green onions. Bring to a gentle simmer for a few minutes to warm tofu throughout. Remove from heat. Place a mesh strainer over the pot and add the miso paste. Dissolve using a spoon or spatula. 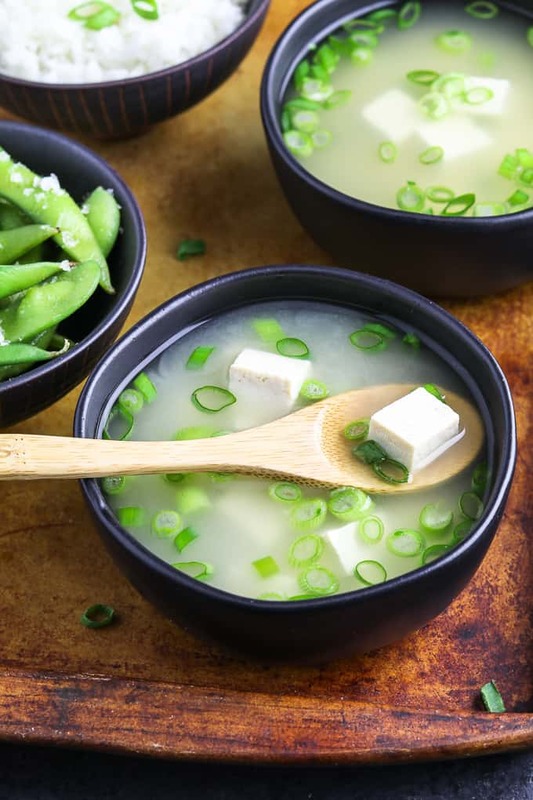 CAN I MAKE MISO SOUP SOY-FREE? Absolutely! You can use Chickpea Miso Instead of soy-based paste and replace the tofu with chickpeas, sautéed mushrooms, or fresh-chopped spinach. 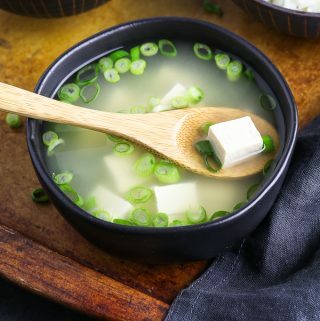 WHAT CAN I SERVE WITH VEGAN MISO SOUP? For a starter or a light meal, you can enjoy the soup on its own, or serve it with rice and steamed edamame pods for a filling meal. It goes really well with vegan sushi too! 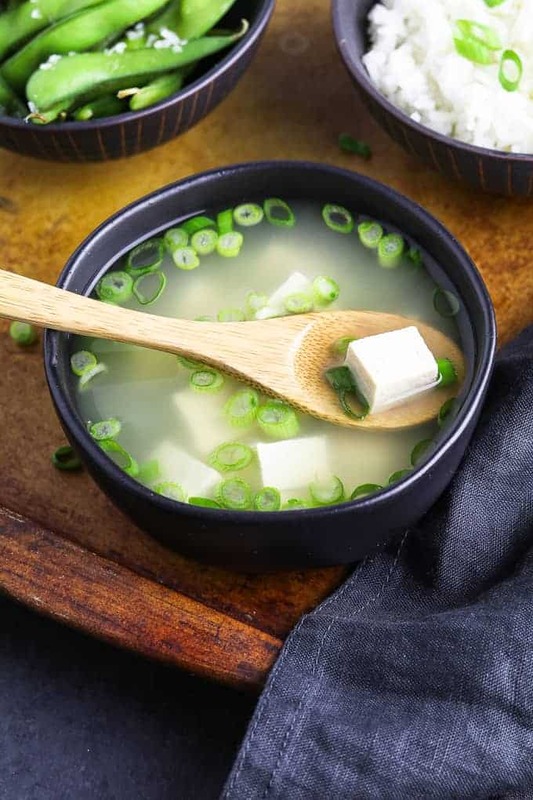 This Vegan Miso Soup can be enjoyed all year long as a starter or a complete meal. It's light, healthy and packed with umami flavors. It requires 5 ingredients and will be on your table in 15 minutes! In a large pot, bring water to a boil over high heat. Now reduce heat to maintain a gentle simmer. Break up nori into 3-4 pieces and add to water. Simmer for 1-2 minutes until it breaks down. Remove from heat and pour broth through a Mesh Strainer into another pot or large heat-safe bowl. Return strained broth to the pot and return to the stovetop over medium heat. Discard nori. Add tofu and green onions. Bring to a gentle simmer for 1-2 minutes to warm tofu throughout. Remove from heat. Place a mesh strainer over the pot and add the miso paste. Dissolve using a spoon or spatula (see note for alternative method) Serve and enjoy! SOY-FREE OPTION: Instead of soy-based miso paste, you can use Chickpea Miso. You can replace the tofu with chickpeas, sautéd mushrooms, or fresh-chopped spinach. SEAWEED: You can use any seaweed to make the broth. If you don't like the taste of seaweed, you can omit that step altogether. If you want a little more broth flavor, you can substitute 1/2 the water with low-sodium vegetable broth. Alternative method to dissolve miso paste: add paste to a medium bowl with about 1/2-1 cup of prepared broth. Whisk well to combine and then add the soup. This looks so good I have to make this for dinner tonight!